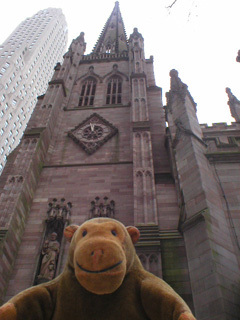 Across Broadway from Wall Street, Mr Monkey visited Trinity Church. The church was founded in 1697 and the current church is the third building. The first caught fire in 1776, the second was pulled down in 1839 after being weakened by snow, and this one was consecrated in 1846. When it was built, its 281 foot high spire was the highest point in all New York. 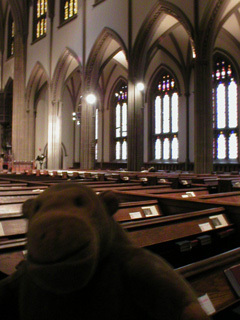 Mr Monkey only had time for a quick visit, because they were about to have a service. Read about the current activities of the church at Trinity Church website.